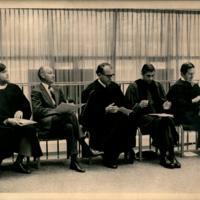 Subject is exactly "Universities and colleges--Faculty"
Judge Jerry Bray, Dr. Norman A. Graebnor, University of Virginia historian and commencement speaker, Dean Wilson, and President Lambuth Clarke reciting from the 1973 Virginia Wesleyan College commencement ceremony program in Hofheimer Library. 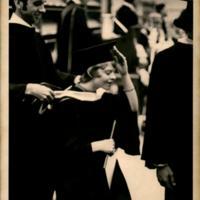 Dr. Steve Mansfield hoods Patti Gill Laycock at the 1973 Virginia Wesleyan College commencement exercises. 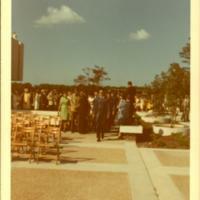 Faculty, students, platform party, and guests attending the 1972 commencement ceremony at Virginia Wesleyan College. 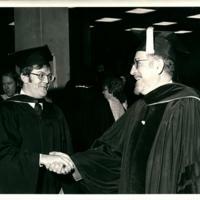 Graduating student, Robert Saul (left), shakes hand with a faculty member at the 1972 Virginia Wesleyan College commencement ceremony. 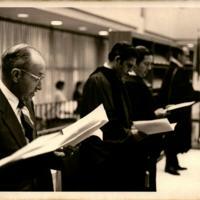 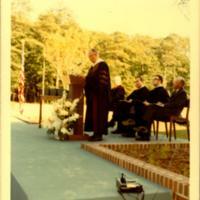 The Honorable G. William Whitehurst, Jr. at the 1971 Virginia Wesleyan College commencement ceremony. 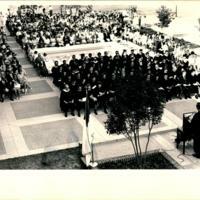 The graduating class, faculty, and spectators seated in the Hofheimer Library plaza for the 1971 Virginia Wesleyan College commencement ceremony. 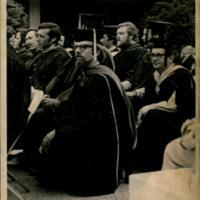 An image of some Virginia Wesleyan College faculty at the 1971 commencement ceremony. 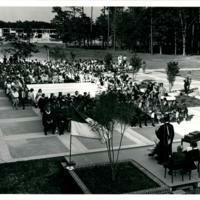 Faculty, students, platform party, and guests attending the 1970 commencement ceremony at Virginia Wesleyan College. 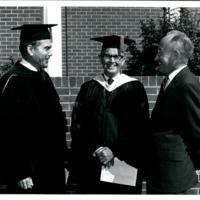 President Lambuth Clarke (left) speaking to Board of Trustees Chair Jerry Bray (right), and Dr. J. Earle Moreland (center), president emeritus of Randolph-Macon College and the 1970 Virginia Wesleyan College commencement speaker. 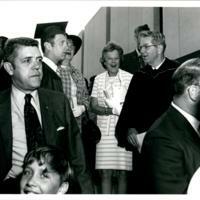 Seen left to right, Wiliam Peacock, Dennie Allen, Bishop Carl J. Sanders and others at the 1970 Virginia Wesleyan College commencement ceremony. 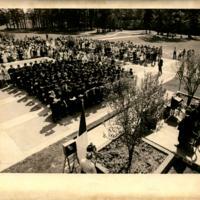 An image of the speaker and faculty presiding over the 1970 commencement ceremony at Virginia Wesleyan College. 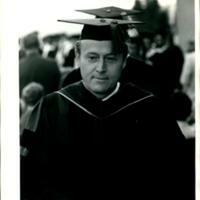 College Marshal Col. Robert Tucker leads the full procession to the Hofheimer Library plaza for the 1970 commencement ceremony at Virginia Wesleyan College. 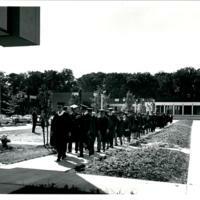 College Marshal Col. Robert Tucker leads the academic procession from Village 1 to the Hofheimer Library plaza for the 1970 commencement ceremony at Virginia Wesleyan College. 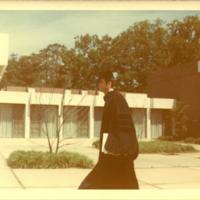 A faculty member proceeding near Village 1 to the Hofheimer Library plaza for the 1970 commencement ceremony at Virginia Wesleyan College. 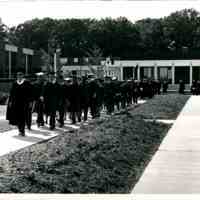 Faculty and students proceeding near Village 1 to the Hofhiemer Library plaza for the 1970 commencement ceremony at Virginia Wesleyan College. 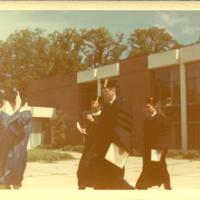 Faculty and students proceeding past guests into the Hofheimer Library plaza for the 1970 commencement ceremony at Virginia Wesleyan College.